Claire and Catkin went out and 'ran some errands' (shopped) on Saturday morning and Gavin and I were in charge of Annabelle. Gavin's job was to get the car and motorbike sorted so they would be all ready to leave early afternoon and head to Ohau for a night of camping. I managed to keep him talking so said job never got done and they ended up staying Saturday night as well! Mwha ha ha - my plan worked!! 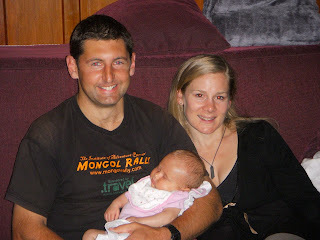 It was so lovely to see them and Annabelle is nearly twice her birth weight now. Still as cute as a button and plenty of smiles. Only 3 weeks and we will be seeing them again in Queenstown. The Fowlers had their Wine Fest/Housewarming on Saturday night which was really good. G,C & A came along as well. There was blind wine tasting that Catkin and I won! Whoop whoop. It wasn't a late night but it was very enjoyable. 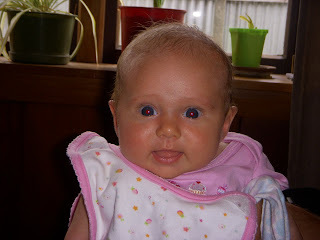 We had a afternoon play date with the Metcalfe's yesterday which was nice. Tahlia was keen to come around and play on the Dance UK Playstation mat again so while her and her friend were having a dance off, Sandra, Claire and I discussed netball tactics and drank tea. It was nice to see them. Asha was also there and was practising his ABC with a game of Claire's by matching the shapes to the letters. I was very impressed he was very good. He told me he loved the letter J. ** Too cute. 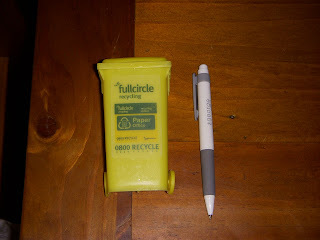 And I got given this mini wheeley bin from a guy at work which I love (the bin, not the guy). You know my love of all things mini!! !